Are you in search of a software that allows you create forms and accept payments using PayPal payment gateways? In this weblog, we are gonna discuss some tools that will make creating forms a breeze. Plus, you can effortlessly collect payment through PayPal without any hassle. Moreover, these forms are safe & secure. Also, you can embed these forms on any website! 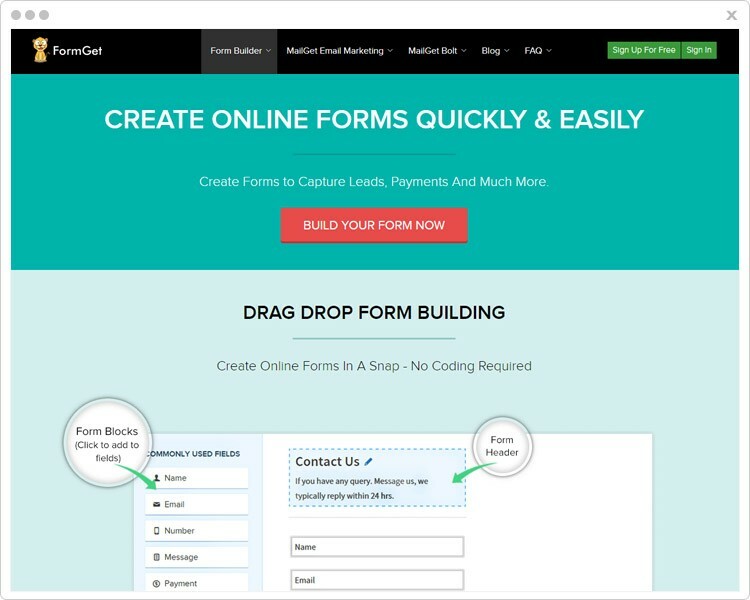 FormGet is a renowned software which proves to be of great use when it comes to creating forms. You can create a form for any cranny including payment collection forms. It allows you to collect one-time as well as recurring payments through payment gateways like Stripe & PayPal. Besides, you can customize the brand logo, color of text and many other details in order to create a form that suits your needs. The first plan that FormGet gives is a Free plan in which you can create a single form and get the features like social sharing, weekly reports, etc. Also, you can embed this form on multiple websites. Another one is Plan 2, where you would be charged $5 per month & get all the features which are applicable like a payment account, upload files up to 20MB, you can store data for 6 months. Plus you can collect payments via PayPal & Stripe. Next is Plan 3 for which you have to pay $35 every month and get access to various features like you can create 25 forms, access 5 payment accounts, upload file up to 2GB and a lot more. For acquiring Plan 4 which charge you $79 per month, along with this you will get 10 users access, 60k form submission per month, unlimited integration with Google Analytics, etc. Further, to avail Plan 5, you need to pay $99 on monthly basis and get access to seamless features like unlimited user access, form submissions, embed forms on unlimited domains & much more. Moreso, you can also integrate with multiple DropBox accounts. With the help of the canned replies functionality, you can prepare custom replies for the frequently asked questions and send them as replies thereby, saving your time and efforts. Conditional logic is another great feature of FormGet through which you can create a dynamic form using certain logic which will let you add conditions as per which the fields will appear. 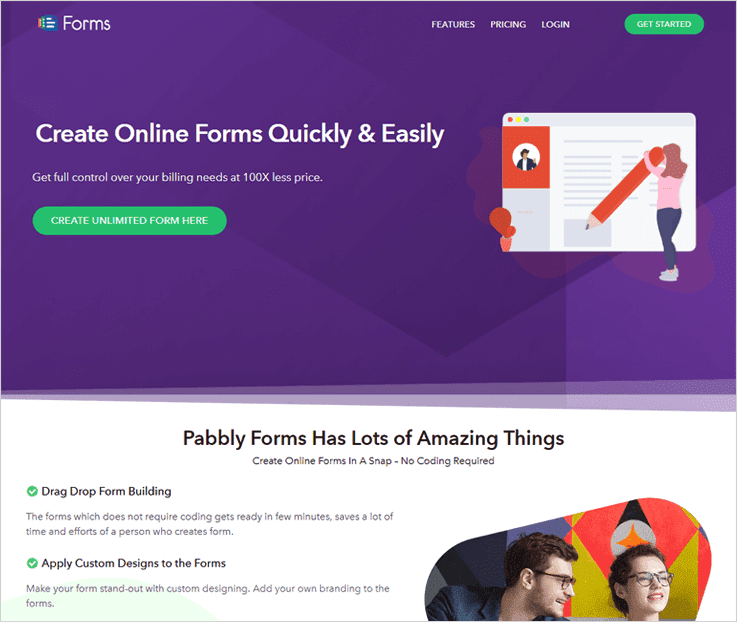 Pabbly Forms is a well known tool to create forms. It empowers you to create multiple forms like subscription forms, payment form, contact forms, etc. You can decide the landing page for the user as soon as he clicks the submit button by adding a redirect link to it. Apart form this, it provides you with more than 260 ready to use templates & also customize the color, branding, logo, etc as per your convenience. Starter- It will cost you $5 per month and you can use its various features like single user access, 1200 submissions per month, embed form up to 10 domains and a lot more Also, you can integrate this with PayPal & Stripe. Rookie- Along with PayPal & Stripe integration, you get access to various other features like you can use 5 payment accounts, create 25 forms, get 100k views per month and much more just by paying $35 every month. Pro- To acquire this plan, you have to pay $79 on monthly basis. Plus, you get access to several other features like integration with multiple DropBox accounts, 18 month upload storage, 7GB upload storage, etc. Advance- This plan provides you with unlimited access to all the feature like embed forms on unlimited domains, form views, submissions, Dropbox account integration & many more features. For availing this plan you have to pay the amount of $99 every month. You can also signup for a free trial in which you can create a single form and embed it on multiple websites. You can create a customize email to notify your users about certain actions like ‘Thank You for submitting the form” or about the updates. You can validate various fields like email id, form Captcha, limit the input of specific info which makes sure that the data is entered by the authentic user. 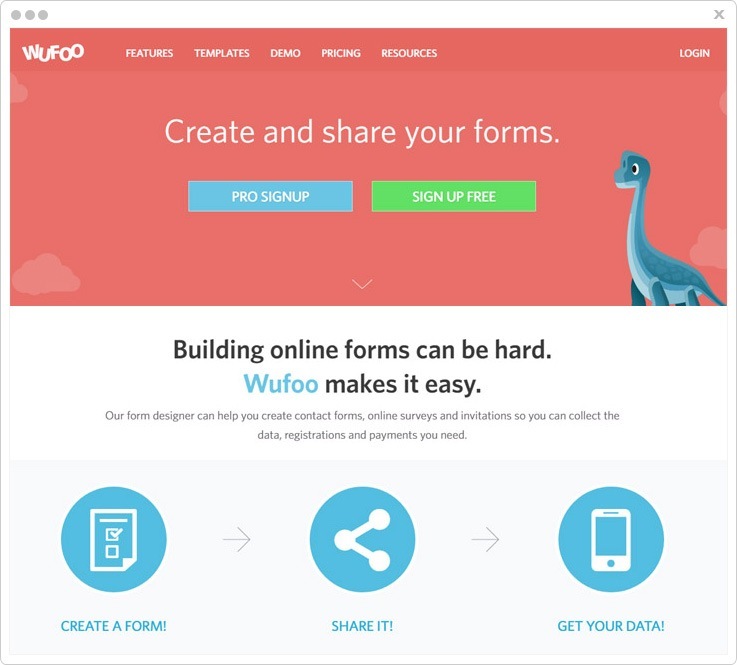 Wufoo – an amazing form designer tool with the help of which you can create contact forms, online surveys and invitations to collect data, payments, and registrations you need. This software accepts one-time & recurring payments via PayPal pay………………….. The first plan of Wufoo is completely FREE forever but only form 5 forms with 10 fields & unlimited reports, 100 entries, 100 API requests, and a single user can access this account at a time. Starter plan is the second pack that this form builder software gives which you can buy at $19 per month. You can only design 10 forms with maximum fields & unlimited reports, can manage 1000 entries, upload data upto 1GB, & 10,000 API request. Another package is Professional plan whose cost is $39/month for unlimited forms, reports, google analytics tracking, custom logo, manage 5000 entries, upload data upto 5GB, 25,000 API requests, and only 5 users can access this account at a time. Last is the Advanced plan which charges $99 per month for unlimited forms, reports, google analytics tracking, custom logo, manage 25,000 entries, upload data up to 10GB, 50,000 API requests, and only 20 users can access this account at a time. Stay informed and organized with the analytics dashboard of this software. You can easily check and analyze entries from any devices as they roll into your account. You can easily collect responses by sharing this forms on any social media platform or embed it into your site. As this forms are mobile responsive so can be frequently open in any browser or system. The first plan of this form maker software is Starter Plan, which is completely FREE for only 5 forms. It also gives 100MB free space, 1000 monthly form views, 500 total submission storage & unlimited reports, fields per form. Bronze Plan is another plan of this software, which charges $19 per month for 25 forms, 10GB storage space, 10,000 form views per month, unlimited submission storage and reports. The third pack that this software gives is Silver Plan, whose cost is $39/month for 100 forms with unlimited form fields, 100GB storage facility, unlimited submission storage and 100,000 monthly form views. Last but not the least is Gold Plan, whose cost is $99 per month for unlimited forms, reports, submission storage, 1,000,000 monthly form views along with 1TB space. Here you will find a variety of free templates which will help you get a quick start on your form-work. All kind of templates whether it’s a payment form, scholarship application form or any form type are available here. Jotform created this theme store in a manner so that anyone can have access to the world’s most beautiful form themes. Here you will find collections of creative, inspired, stunning form templates that fit your every need. 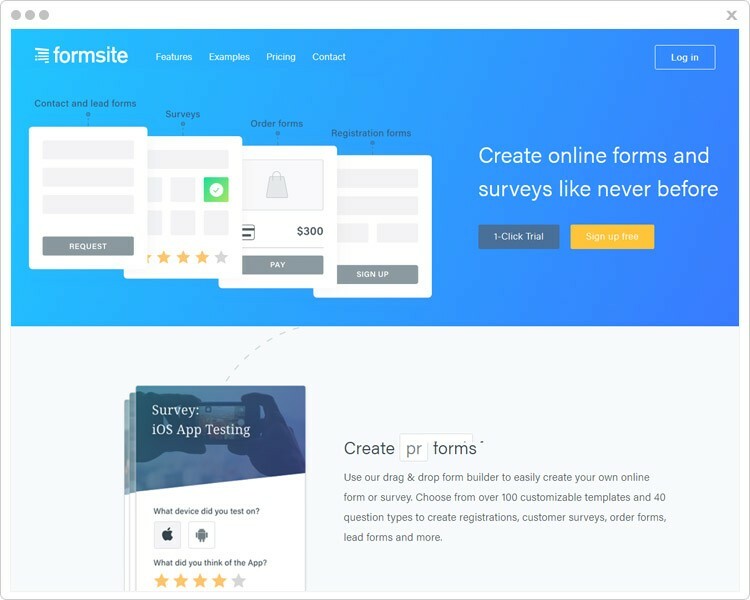 Formsite – a responsive form creator software with which you can easily create any kind of forms by simply dragging the required field. Also, you can share this forms on any social media platform or embed it on your site. With it, you can also collect payments via PayPal. First is the Free plan, you can create 5 forms and accept 10 form submissions per form and 50MB file space. Deluxe plan: It charges you $149.95 per year ($14.95 on monthly basis) and gives you 5 forms creations, 500 results per form and 500MB file space. Pro 1 plan: For this plan, you have to pay $249.95 per year ($24.95 on monthly basis) and allows you to create 10 forms, 1GB file space and get 1000 form submissions per form. Pro 2 plan: With this plan, you can create 25 forms along with 2500 form submissions per form, get 2GB file space. It will charge you $499.95 per year ($49.95 on monthly basis). Pro 3 plan: It offers you 4GB file space, 100 forms creation along with 10,000 results per form. And will charge you $999.95 per year ($99.95 on monthly basis). With this software will help you connect with multiple software like Dropbox, Google Drive, MailChimp, Microsoft OneDrive, Salesforce, Zapier and a lot more. Use personalization tool to target visitors interests and address them individually. Also, you can send automated reports to management for manage the response of your customers. Collect payments anytime, anywhere with PayPal payment gateway. The first plan of this software is Paperform plan which you can buy at $15 per month. Here you will get unlimited forms, 1K submissions per month, 1 payment account, custom email response and much more. Another package is Paperform Pro where you will get unlimited forms, submissions, 3 payment account, custom email response, webhooks, embed to 30 domains, etc. For all this, you have to pay $39/month. Last plan Paperform Agency whose buy cost is $99 per month for unlimited forms, submissions, 3 payment account, custom email response, webhooks, unlimited embedding, custom HTML & CSS support etc. With Zapier tool of this software, you can connect with over 750 apps without writing a line of code. 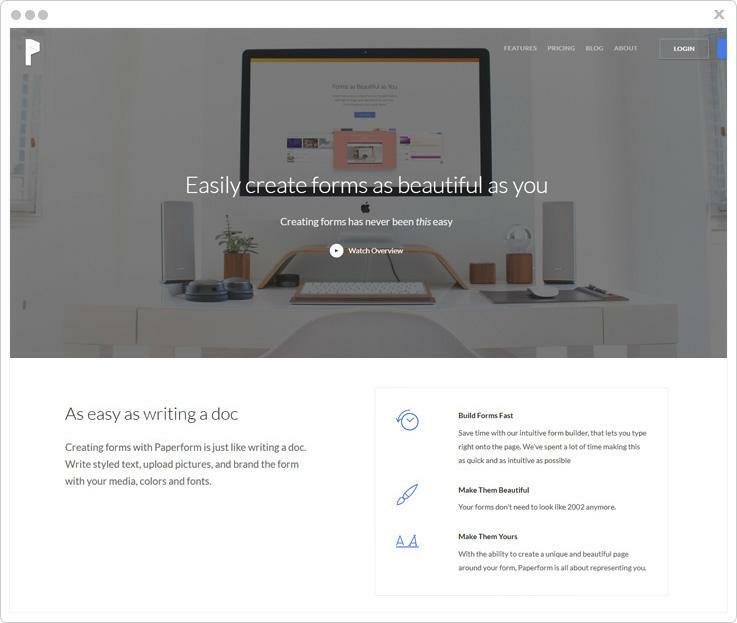 You can effortlessly embed your forms into WordPress, Squarespace, and other sites. Either you can also share your forms on Facebook, Twitter or can directly share them by using its unique URL. We hope that above-mentioned information about the form creator software that helps you in collecting one time & recurring payments via PayPal & Stripe is sufficient for you. So, don’t waste any more time and start gathering leads and revenue for your business through forms. 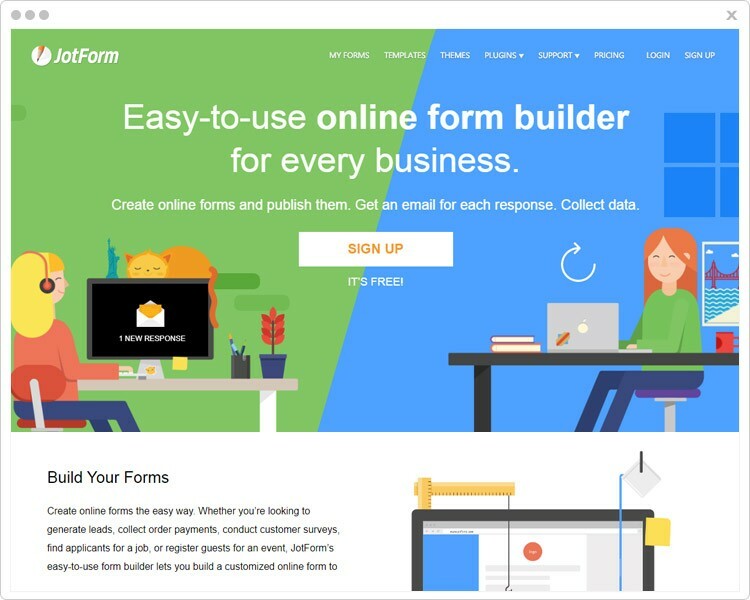 Form Builder Software create online forms with no coding. For any more queries and suggestions, contact us! We’ll get back to you as early as possible.